Despite to much evidence to the contrary, I love it when somebody proves me totally wrong. Such was the case with this pairing. I know Bellwoods’ 3 Minutes to Midnight well. We got the first ever cask of it at Castro’s for our 50th anniversary celebration of the Cuban Missle Crisis. I’m not sure if they were already knocking the name around, or if it was inspired by the event, but either way, we got a firkin of it, and it was all I could do not to drink it all myself. Their epic Hellwoods Imperial Stout aged on sour cherries. Awesome. On the other hand, I can’t even exactly remember how or when I got this bottle of Sour Cherry Imperial Stout from Amsterdam. I think it was about a month ago when I scored some year-old Vicar’s Vice. No matter, I assumed, an imperial stout aged on sour cherries, it must be in the same category, right? Nope. Iain and I often chirp each other, and when I told him about the pairing he told me I was being a fool. What I didn’t realize when I paired them up, was that the Amsterdam beer was a sour stout, barrel-aged on all manner of bacteria, as well as cherries. It was not just Tempest on cherries, which I had assumed. While I totally trust Iain, it wasn’t until I tasted them both today, that I realized that they are, in fact, completely different beers, despite looking nearly identical. But the show must go on! From a Bellwoods 650ml bottle with what I think is my favourite label of theirs, 3 Minutes to Midnight pours a deep black with glimmers of crimson at the edges. Small chocolate brown head drops to a ring with some wisps of foam lingering. The aroma is huge coffee and chocolate, with bright cherries. There is a vinous note, some chewy leathery malts and some leafy hops. From a 650ml Adventure Series bottle, Sour Cherry Imperial Stout also pours an opaque black, with traces of brilliant red at the edges. A slightly lighter, slightly fuller head also drops to a thick ring. Aroma here is where the roads split apart. The nose is tart and lactic, with some funkiness that I’m guessing is pediocaucus bacteria. There’s cherries and burnt sugar too, that with the funk give it a balsamic vinegar-like aroma. There is no way to pick one as better than the other here. They are both excellent. 3 Minutes to Midnight immediately shows big charred malts on the palate, with huge bitingly bitter leafy hops. There is coffee, rum and leather, with dry cocoa and a huge shot of boozy heat. Cherries are subtle (though I suspect it’s not that the cherries aren’t full and flavourful, they’re just partying with some really flavourful hops and malts). They’re nicely tart, and have a slightly earthy or even nutty taste. I hate to sound pretentious, but it makes me wonder if the cherries had their pits in them when they were added to the beer. The finish is smokey, with a touch of fruity cherries and a huge bitter dry hoppy linger. Sour Cherry Imperial Stout is a whole different ball of wax. Sharp and funky right away, it actually takes a second to pull apart what’s going on under the sharp bacteria notes. The fruity taste is not just cherries, but with hints of raspberries as well (there aren’t any in there, it’s likely just the combination of the cherries and lactic bacteria). The stout gives some cocoa dry bitterness and a touch of smoke, but the fruit and the bacteria are the big show here. There is also a touch of oak that I’m guessing is from the barrel. As it warms, hints of chocolate and pepper start to show as well. The finish has a minerally dryness, that might be from the burnt malts or the hops (or both) and which is surely augmented by a drying bacteria like Brettanomyces. 3 Minutes to Midnight is a perfect adaptation on Bellwoods’ incredible Hellwoods. The cherries add an amazing layer to the already complex beer, but it doesn’t become fruity, and it’s impressive hops retain their focus. Sour Cherry Imperial Stout is a remarkable sour, and is evidence of how good Iain is getting at barrel-infected beers. These flavours could easily have become a hot mess of booze and infection, but they don’t, they weave around each other perfectly. I wouldn’t be surprised to find this beer (like many sours) to be fairly polarizing, you’ll either really dig it, or find it too much for you, but it’s totally worth trying. I think it’s incredible and want to drink many many more bottles. In the final “fight” analysis, both competitors walked into the ring with much fanfare and pomp, bumped fists and agreed to a clean fight, then waited till the bell rang, embraced each other, and walked out of the arena and headed to the nearest bar for a beer. Two amazing and totally different beers. 3 Minutes to Midnight is available at the Bellwoods’ retail store, and as noted, very rarely at bars around Toronto. 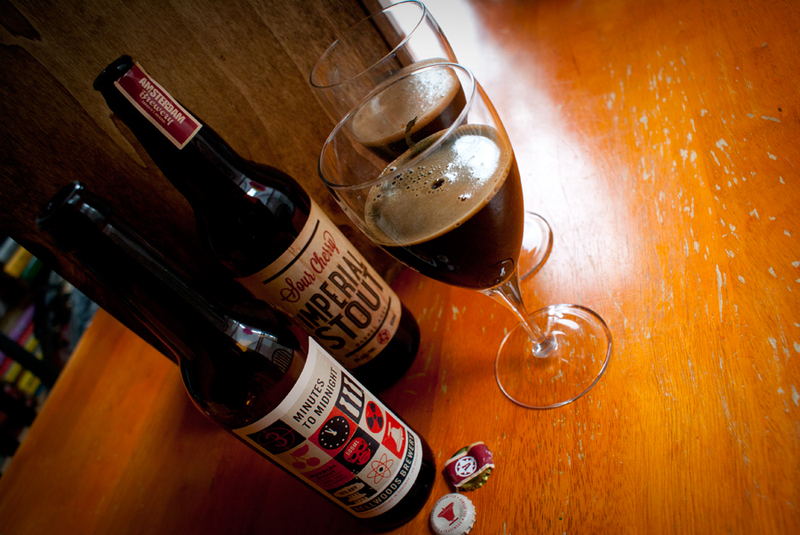 Sour Cherry Imperial Stout is only available in bottles at the BrewHouse (not the retail stores). Actually, the Sour Cherry is the easier match, I would drink it with a funky blue cheese. Not too salty, more in the tart range. It would be perfect. 3 Minutes to Midnight is a bit tricky, because I would be concerned about trying to work in both the huge hops and subtle fruitiness. I wonder if a good tiramisu would go well here? I have no tiramisu on hand to try, but the creaminess would provide a great textural juxtaposition, and the coffee would go well with the charred malts. I fear the sweet dessert would still get dominated by the beer though. As an aside, I bet it would be awesome to drink 3 Minutes while also sipping on grappa (two Italian tastes for one beer? Really? ).